The DEXIS CariVu device is a fast, painless way for us to thoroughly examine your smile. The device shines a safe, near-infrared light on your teeth, making the enamel appear transparent while highlighting areas that are decayed or cracked as dark areas. This helps us to identify areas that need treatment at the earliest possible stage, enabling us to provide you with conservative care before the problem becomes more serious and more painful. 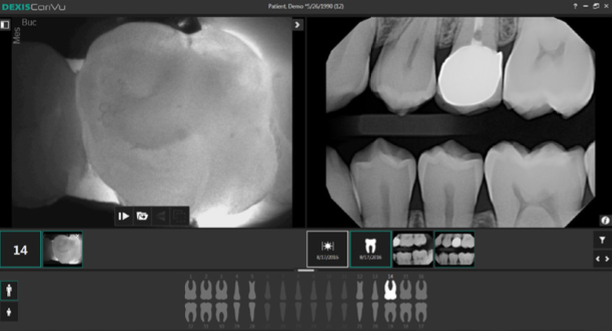 You may notice our team using the DEXIS CariVu caries detection device to confirm the findings we see in X-rays of your teeth. This helps us determine whether your smile would benefit from a restoration. To learn more about how we use the DEXIS CariVu in and the other types of state-of-the-art technology we feature at our office, please feel free to contact us today.